Designed by the tradespeople - For the tradespeople. A SmartCard system designed to hold all your qualifications in one card, future proofing the HVACR industry, included in your ARMA Full RAC membership. Your ARMA team are so confident in the ARMA SmartCard we believe it will and should become the revolutionary new licence for the HVACR industry. Bringing modern technology to the (HVAC&R) Heating, Ventilation, Air Conditioning and Refrigeration Trade. Real time technology assisting tradespeople, business, consumers and regulators. 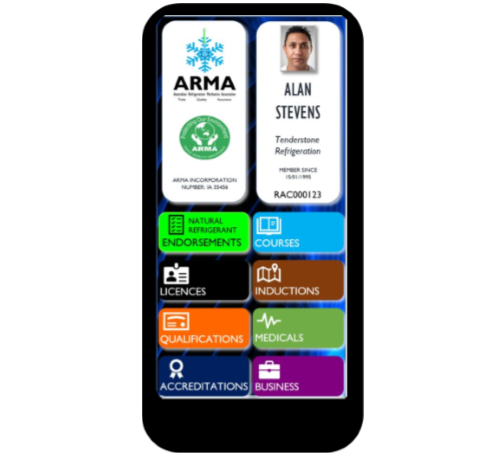 ARMA's SmartCard provides instant access for prospective employers or inspectors with real time licencing information and qualifications, no longer hindering the process of establishing if the licence holder has the correct qualifications and this also extends to consumers being able to determine if the tradesperson they hire is qualified for the scope of works. 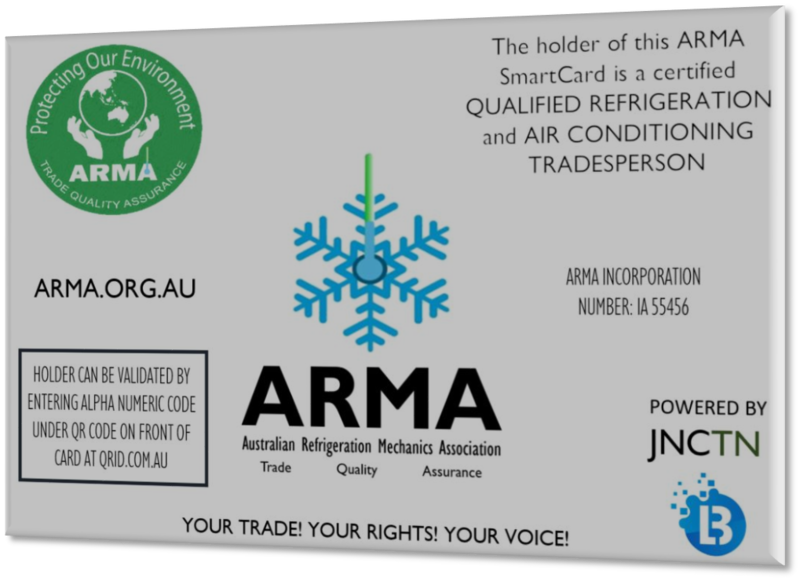 In support of Australia’s international agreements to reduce greenhouse emissions the ARMA SmartCard benefits include raising consumer awareness and ensuring appropriately skilled tradespeople are carrying out the work. (ARMA) Australian Refrigeration Mechanics Association are now providing a low cost industry solution with a secure database and ease of administration abilities allowing ARMA to deliver a comprehensive solution. ARMA are confident the design will become the must have licence for all trades and services, easily developed to suit the specific trade by the industry experts. Users need only scan the QR code to see all the individuals’ qualifications. One SmartCard to hold all your qualifications and licences. Unscrupulous RTO’s offering 5 to 7 week part time courses in Certificate III refrigeration and air conditioning and 2 to 3 day courses in Certificate II split system courses for peripheral trades will no longer have validation of their certificates via ARMA’s stringent vetting process. ARMA's quality assurance processes includes ensuring only qualified assessors are validating individual licences. Reducing the risks of OH&S for tradespeople, business and consumers, by ensuring non technically competent persons cannot gain access to the ARMA refrigeration & air conditioning smartcard. ARMA have actively monitored many unscrupulous RTO’s with very little success via regulators, inclusive of ASQA. So it was time to find a solution that could be cost effective and benefit all stakeholders. Until now consumers had no access to information correctly advising who is trade qualified to carry out refrigeration and air conditioning works, current licencing structures are confusing and often misleading. Ready to apply for your ARMA SmartCard? Apply Here! Meets the requirements for the environmental refrigerant handling licence & authorisation licence. Meets the requirements for Australia's highest standards of licencing in NSW & QLD. Incorporating all certificates relevent to working within the industry, ie: First Aid, Working at heights etc. One SmartCard to hold all your qualifications. Includes optional medical information to ensure emergency services have real time access to information in the event of any incident ie; diabetes, blood type, asthma. 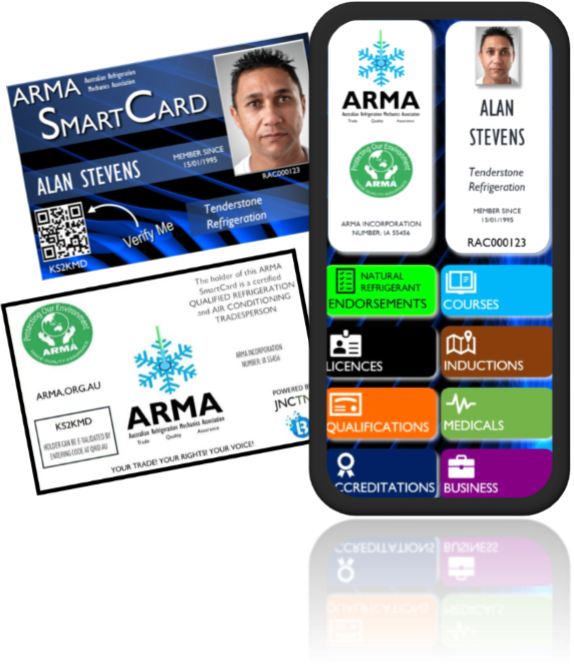 ARMA's revolutionary SmartCard for Refrigeration and Air Conditioning Tradespeople and Businesses. Providing access to all your qualifcations and certificates in "Real Time". *Natural refrigerant units of competencies are required to work with Co2, Ammonia and Hydrocarbon, if you don't already hold the required competencies, you simply upload them when you do. Licenced with QLD's Department of Mines and Natural Resources? Too easy just include your licence details for Hydrocarbon. Applicants must be able to provide evidence of having completed an appropriate apprenticeship in Refrigeration and Air Conditioning. The ARMA smart card system supports trade qualified RAC working with natural refrigerants only. Own a businesss? Make sure to check out affordable advertising with ARMA below! Not yet an ARMA member? The ARMA smart card is inclusive of your membership. ARMA are currently offering 400 members the discount of the SmartCard establishment fee waived $85. Additional fees apply after the first 5 uploads every year of all your credentials a maximum of five (5) credentials loaded over a twelve (12) month period. This facility does not roll over periods. ARMA does not profit from this scheme. ARMA's revolutionary SmartCard for Refrigeration and Air Conditioning Apprentices and Trainees. To ensure apprentices and trainees can continue their membembership with ARMA we have made the smart card an optional extra. Natural refrigerants endorsements are inclusive. The ARMA smart card is optional for apprentices $130 per year. ARMA are currently offering 400 members the discount of the establishment fee waived $85. Individulas choose what qualifications and certificates they want displayed and have total control over who has access to their information on the SmartCard. As individuals retain control of who can access their information, this means for companies, employees can provide access allowing individual companies to see in real time they are meeting risk mitigation factors and companies will also have the benefit of sending alerts to employees for meetings, events and all other notifications. When the employee leaves one company and commences work for another the employee simply changes authorisation. A simple and easy risk mitigation tool for PCBU’s to ensure that all staff and contractors are trained and competent to perform their job safely. Project Managers (who are officers under the law): “what steps they currently take to ensure the company in which they are employed complies with its WHS obligations and duties on a project, and what additional steps (if any) they could take to satisfy the types of due diligence expected to be exercised by an officer of a company which has WHS obligations and duties”. Reduces administrative costs by up to 83%. Most companies finding gains of at least 50%. Records are in real time. Reduces human errors when transferring and interpreting courses and qualifications. Produces alerts and emails when expiries are falling due. Anyone can scan the card. Technology is simple to use. Employees only need one card, one card to carry all cards. Extend the card to your sub-contractors to manage your biggest risk. Don’t need to constantly update and reissue cards. Offline solution for high risk environments. Future proofing as technology develops. Security level is the same as a credit or debit card. Completely portal between projects and roles and regions. Environmentally friendly, greatly reduces the use of paper based passports and printing of spreadsheets. Consumers currently have no access to information correctly advising who is trade qualified to carry out refrigeration and air conditioning works, current licencing structures are confusing and often misleading. The ARMA SmartCard ensures consumers are confidently using appropriatley skilled and licenced RAC tradespeople. Reducing illegal scope of works. Providing stronger warranty & insurance protection to consumers by providing the tool to assess if the tradesperson is licenced to perform the scope of works, thereby reducing risk of loss of insurance. Providing consumers the ability to contribute to reducing greenhouse emissions. 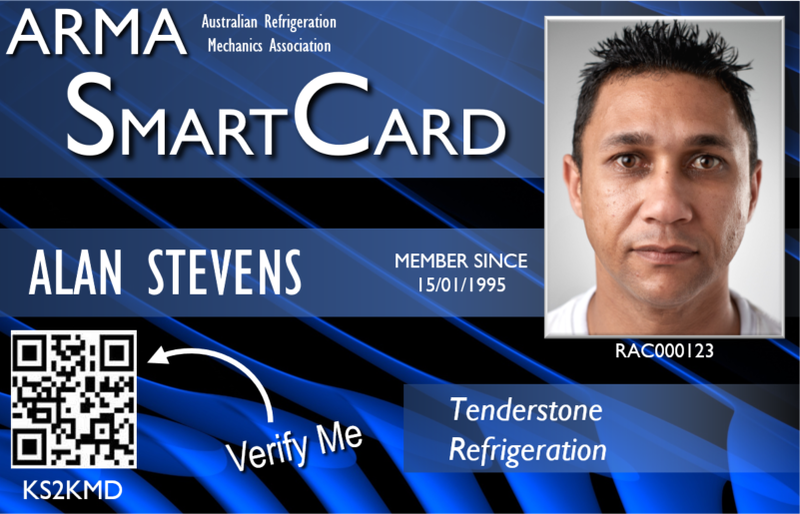 The HVAC&R industry licence holders throughout Australia will now be able to hold a single card which allows regulators, agencies and industry bodies’ and consumers instant access and ensures all licences holders are current with licencing requirements, regardless of which State or Territory they work in and regardless of different legislative requirements. The individual continues to retain control and provides approved authorisation to the State or Territory they work in as well as any industry group they have membership with such as ARMA. Regulators, Agencies and industry bodies also have the ability to send out alerts to industry as a whole (Within their Authorisation). No more paper format with licencing renewal reminders, industry notifications and all other typical paper formats currently in use. One consistent data set for management. Issuance and transactions of card can be completed electronically. Transparent medium that can be audited quickly. Provides faster reporting on metrics to industry. Facilities faster governance and compliance oversight. Data base holds large data sets for analysis to formulate policy. Information stored against agreed standard and could be shared/integrated across other platforms. Compliance information (including changes) can be pushed to card holders. Cards can be deactivated remotely. Significantly more cost effective than dumb cards. Purchased the ARMA SmartCard and own a business? Checkout our low-cost advertising rates below. 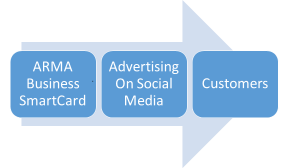 ARMA membership now includes the ARMA SmartCard, allowing your business to advertise at a low monthly rate. and below is how consumers can find you in their local area by simply entering their suburb or postcode. Advertising just got easier by linking the ARMA SmartCard with our Facebook media campaign. Most advertisers are now turning to social media and consumers expect it. ARMA's strategy is to educate consumers, encouraging them to look for trade qualified refrigeration and air conditioning specialists. That's why we have designed our Facebook Consumer page and consumer webpages. Combining the ARMA SmartCard and advertising campaign on Facebook brings industry and consumers together. Providing HVACR businesses with the opportunity to advertise to millions of Australians. Be a part of the revolution - Your ARMA SmartCard, inclusive of your business credentials are all you need. Contact your local Fridgy, enter your suburb or postcode.